It’s time – take a look to see which pieces you want to add to your art collection. 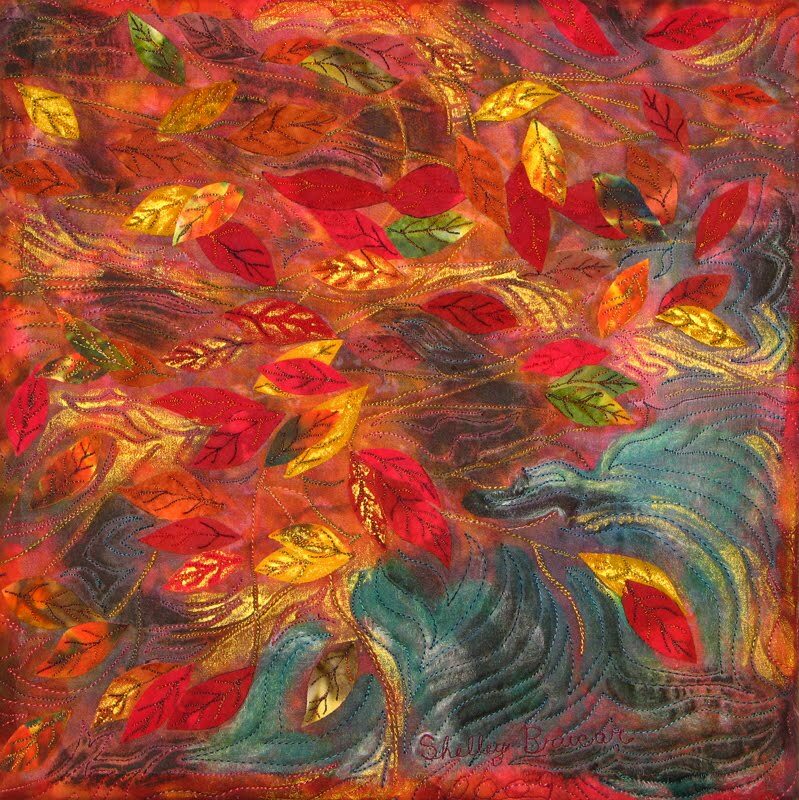 Studio Art Quilt Associates 12″ square auction starts September 20, 2:00 Eastern time. Almost 300 pieces have been donated by SAQA members for this annual fundraising auction, with proceeds supporting SAQA exhibits, catalogs and outreach. With pricing from $75 to $750, there is something for every budget. The 2010 SAQA Benefit Auction will start September 20 at 2:00 Eastern time with the pieces on pages 1a and 1b and a bid price of $750. The price will drop to $550 at 2:oo Eastern time on September 21. Then it will go to $350 on September 22, $250 on September 23, $150 on September 24, and a final bid price of $75 on September 25. The auction for artwork on pages 2a and 2b will begin September 27, and pages 3a and 3b will begin October 4. To view artwork and learn how the auction works, please visit: http://www.saqa.com/news.php?ID+1423. Above: Some pieces currently on my design wall, waiting to come together. 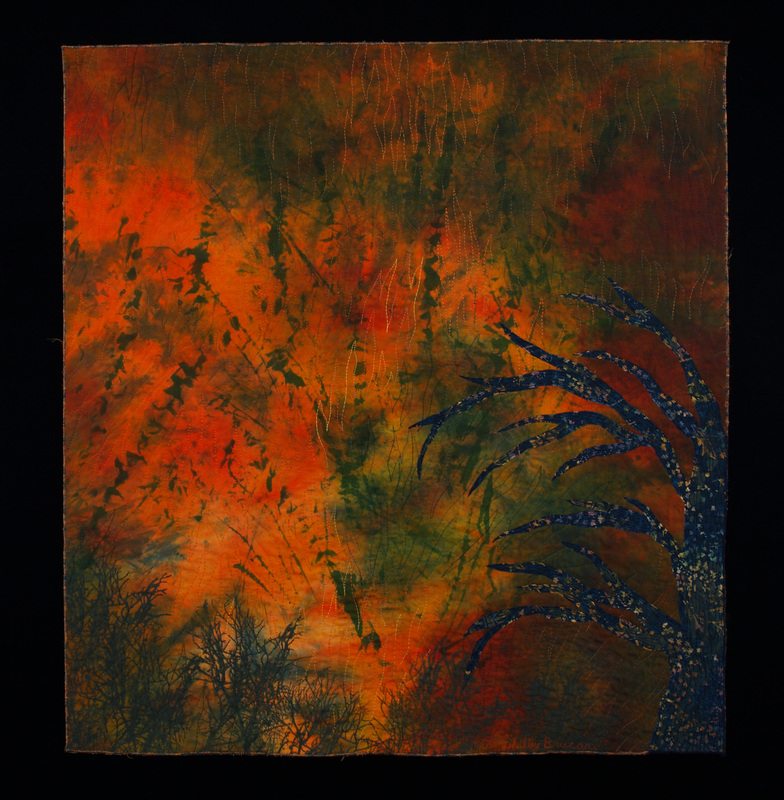 In today’s ART BIZ BLOG, Alyson Stanfield refers to “Brag! How to Toot Your Own Horn without Blowing It” by Peggy Klaus. It’s a book about how to let others know about your art and your accomplishments. The Art Biz Blog lists 12 questions to help artists think about and define how to describe their art. Any book or conversation about marketing suggests an “elevator speech” – a way to quickly and simply talk about what you do in a way that will spark interest. Alyson’s questions are sure to spark ideas for what to include in your elevator speech. These questions will also prove thought-provoking for anyone wanting to talk about what they do; it’s not just for artists. One of the questions is “what do you like/love about being an artist?” That can be a surprisingly difficult question to answer. I’m not sure how I would answer. I know I love being in my studio; I get so excited about dyeing or painting fabric and watching color magically appear (yes, it still seems like magic to me!). It’s energizing to step back from the design wall and like what I see. It can even be fun to cope with the struggle that is often part of a new piece coming together. Taking a piece off the wall and cutting into it can be amazingly empowering! I know I feel good in my studio, that working on art is not really work, but more therapeautic. I know I love exhibiting my work and talking to people who come to see it. 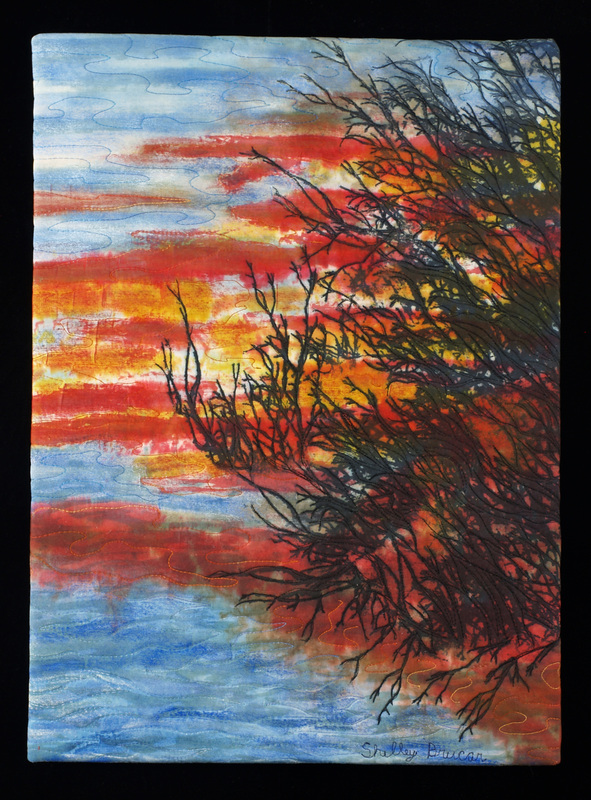 I love it when someone seeing my work expresses delight and “gets” what I’m trying to do – to get the viewer to let go of the demands of the day and step into the art. I love feeling creative, maybe because I grew up believing that I did not have a creative component to my being. I now believe that everyone has a creative part and that using one’s creative part is simply a matter of letting go of old, rigid ideas and allowing the creative energy to emerge. The last question Alyson asks is “In what ways are you making a difference in peoples’ lives?” I know I want someone viewing my art to feel the serenity and peacefulness that I feel every step of the way, from original idea or first bit of color to fabric, right up to the last stitch. Is that happening? This week, I discovered an artist whose work really drew me in. His name is Adam Thomas, and his paintings absolutely glow. It’s not just that they are nature-based, which always gets my attention; it’s also the colors and the wonderful movement. You can go to his website to see, or view Adam’s work live; he has an exhibit going on right now at the Edge Gallery, 6318 Clark Street, Chicago. This exhibit goes through Wednesday, July 28. If you miss it, his website shows another exhibit, starting September 16 and running for two months, at Uncommon Ground, 1214 West Grace Street, Chicago. I will definitely get to that one. Simply Chicago Art is hosting special events including music, trunk show and Shakespeare. Events take place the evenings of Thursday 7/22 and Friday 7/23; I will be there on Friday and hope to see you! “Impressionist Landscapes in Fabric” can be viewed inside the gallery. Friends, Families, Patrons of the Arts! An unexpected cancellation for the Momentum Theatre Troupe is a boon for us. Momentum is dedicated to bringing bold, innovative theatre to diverse audiences on their mobile theater—a one-of-a-kind converted truck that opens into a multi-level jungle gym of a stage. This Thursday and Friday only, they will be performing three plays (see program below)for your evening’s entertainment. Along with their performances we will also have live music beginning at 6:30. We also present the best in art from a number of local artists, selling their works of art from the trunks of their cars! Come one, come all and partake in an evening of fun entertainment. Performances are suitable for all ages! See you there and Please bring a chair! A short absurdist political comedy in which the people anxiously await their beloved Leader—only to discover he’s not exactly what they thought. A story of power, revenge, identity, and love which will see the cast climbing all over, under, and around the theatre truck, armedwith Shakespearean verse, battling storms, monsters, and magic. Want to know more about Momentum? Have five minutes? Listen to their public radio mini-feature! 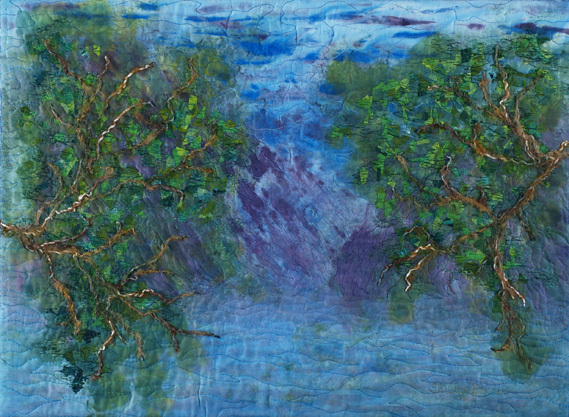 “Impressionist Landscapes in Fabric” exhibit July 10 through August 1 at Simply Chicago Art, 1318 Oakton, Evanston, IL. Regular gallery hours are Saturday 11:00 to 7pm and Sunday 1:00 to 6pm or by appointment. 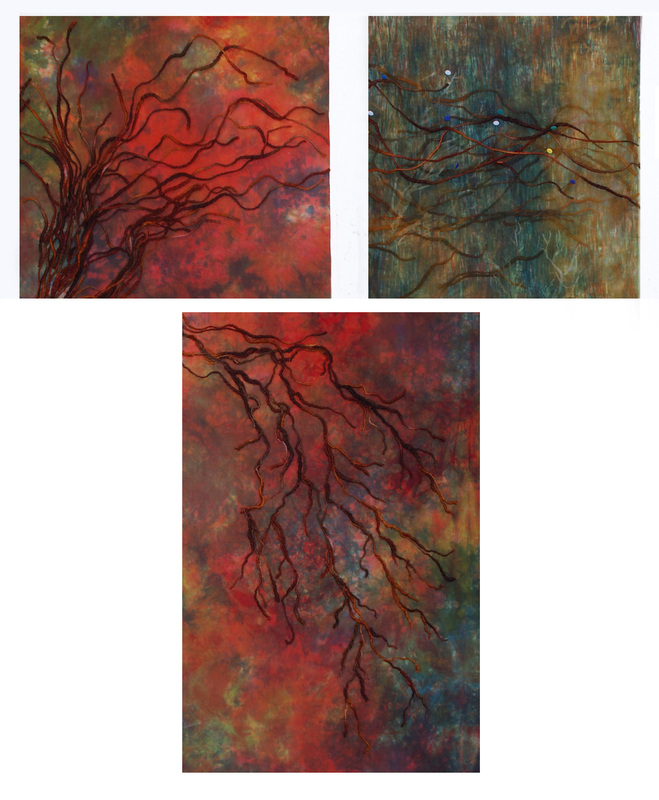 Join us for Artist Reception: Saturday, July 10, 1:00 to 5pm. This past weekend at the Fountain Square Art Festival, I discovered two fantastic jewelry artists from New Mexico. They are Katherine Goulandris and Michael Burris of Studio Q Jewelry. Their intention is to “step outside the box” and surprise their customers, and they do this well; their designs are unique and beautiful. I don’t purchase much jewelry because I find that when I do, it winds up sitting in a drawer, never to be worn. But I could not resist a necklace from Studio Q; these pieces are just too wonderful to pass up! After much deliberation, I selected style 102 of the Bolero collection with a darker stone than the one pictured on the Studio Q website. And I have already worn it!